Ear infections in dogs are generally not difficult to detect. Some dogs can become extremely uncomfortable when suffering from an ear infection. There are also some breeds more prone to ear infection, especially those with long floppy ears. While dogs cannot tell us their ears hurt, there are several symptoms to look out for. And, depending on the cause of the ear infection, there are several ways to go about treating ear infections in dogs. Though ear mites are usually a contagious parasite which results from contact with another infected animal, yeast and bacterial infections often are secondary infections. 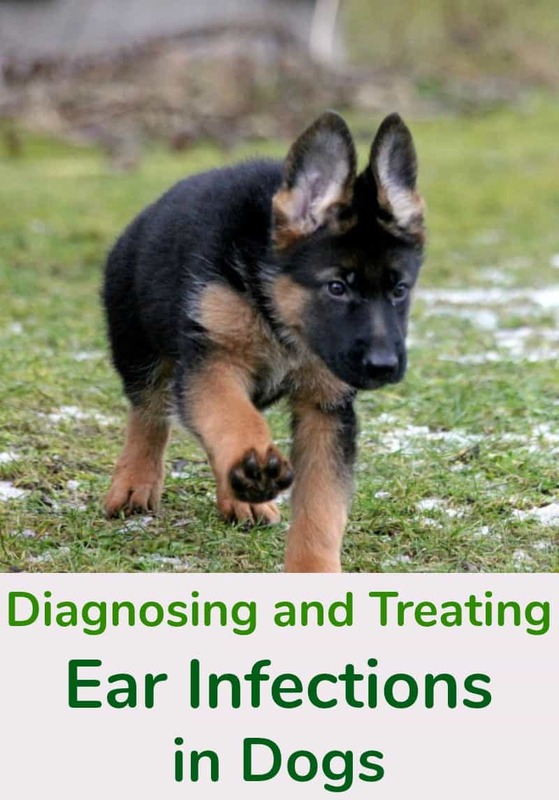 Allergies to food, fleas or other items often play a role in the development of an ear infection for a dog and often result in secondary types of ear infections. Canine atopy also can predispose a dog to develop secondary ear infections. The diagnosis of an ear infection in a dog will likely need to be made by your veterinarian. Your veterinarian will need to examine your dog and take a closer look at your dog’s ears. It will likely be necessary to examine samples collected from within your dog’s ear canals to determine the cause of the infection. Your veterinarian will examine these samples under a microscope, often using special stains to help identify yeast and bacterial organisms in the samples. This is known as an ear cytology study. On occasion, anti-inflammatory medications, such as prednisone, prednisolone, dexamethasone, or another type of steroidal medication, may be needed to help reduce the inflammation within the ear canal of an infected ear. NSAID medications are sometimes used for this purpose as well. Your dog’s infected ears will need to be cleaned and flushed properly at some point during the treatment process as well. Your veterinarian may recommend doing this immediately or may advise trying to reduce some of the inflammation in the ear before proceeding to a thorough clean and flush of the ear canal. In addition, your veterinarian may need to sedate your dog to clean and flush the ear properly initially. Sedation may also allow your veterinarian to examine the tympanum (eardrum) of your dog’s ears more thoroughly. If the inner ear is involved in the infection, your veterinarian may need to use specialized techniques and equipment to flush the inner ear as well as the rest of the ear canal. Most ear infections can be cleared up with a round of medication. However, in severe and chronic ear infections, surgery may become necessary to ablate the ear canal and may be the only option available to keep your dog comfortable. This is good information to have on hand.